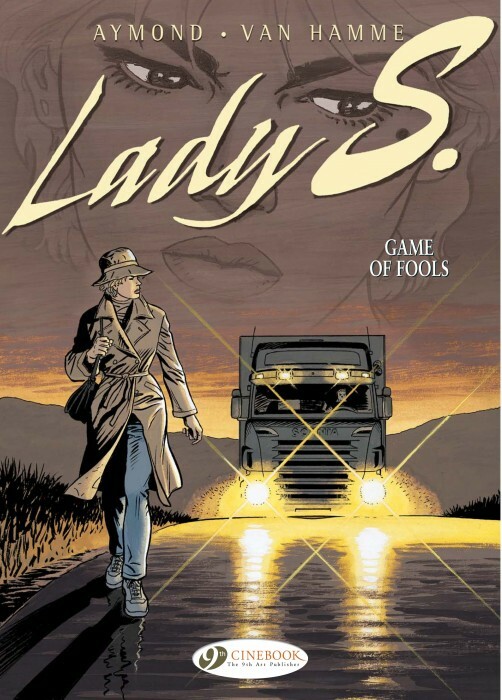 The Canterbury based graphic novel publisher Cinebook have just released their catalogue for the second half of 2011 and it shows their continued dedication to bringing previously untranslated Franco-Belgian bandes dessinees albums to the English speaking world with an impressive selection of titles. The twin backbones of Cinebook's releases continue to be the bimonthly releases of both the humorous Lucky Luke titles, written by Rene Goscinny and illustrated by Morris, and the XIII adventure titles, by writer Jean Van Hamme and artist William Vance. By the end of 2011, Cinebook will have published 10 of the by then 20 XIII albums and 32 of the 76 Lucky Luke albums - taking both series far beyond any previously published English language translations by other companies. In addition they will continue publishing the new series Long John Silver and Crusade as well as returning to older favourites like Lady S and Thorgal. 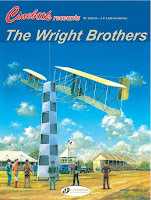 The Recounts aviation documentary series continues with Cinebook Recounts The Wright Brothers, a title previously scheduled in January 2009 as Biggles Recounts The Wright Brothers but which got cancelled due to events between the estate of WE Johns and the original French publisher that were beyond Cinebook's control. Science fiction titles are also coming to the fore again with more Orbital and Valerian books as well as a return to the Worlds of Aldebaran series by Leo. Having published all five of the Aldebaran cycle from this series followed by all five of the Betelgeuse cycle, October will see the beginning of the Antares cycle. 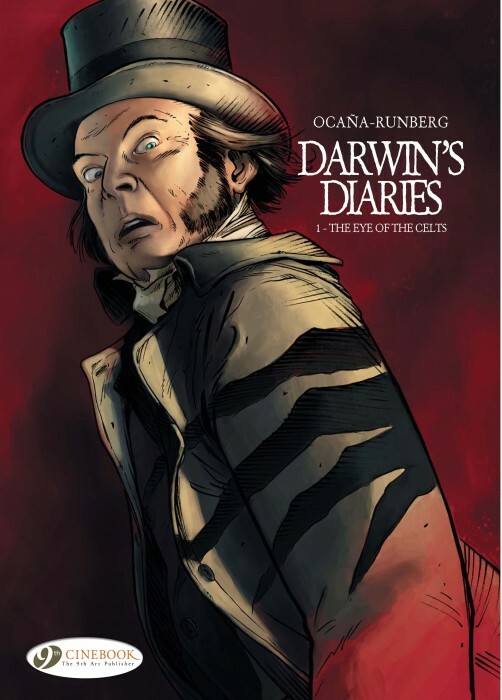 Perhaps the most intriguing of the new titles will be Darwin's Diaries, the first book of which will be published in September and which has the police asking the famous naturalist to investigate a crime that may involve a legendary creature. • Cinebook will be attending the Bristol International Comic Expo next weekend, 14/15 May 2011, and their latest catalogue is available as a PDF download from their website. Free Comic Book Day is here! Saturday 7th May is Free Comic Book Day - the day many specialist comic shops across the UK join with stores across the world to promote our industry by offering a range of free comics to attract, potentially, many new customers. 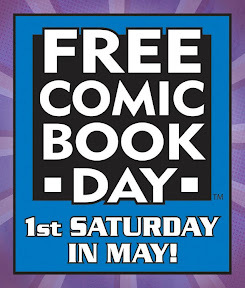 As the name implies, Free Comic Book Day is a single day when participating comic book specialty shops across North America and around the world give away comic books absolutely free to anyone who comes into their shops. Held the first Saturday in May each year, yes, the comics offered are really free, although different shops have policies on how many free comics you can receive. But you will receive at least one free comic if you enter a participating shop location. Check with your retailer for their policies and plans for FCBD. Not every comic book store in the world doing this. Don't expect your local corner shop or WH Smiths to take kindly to you trying to walk out with the latest Beano or 2000AD (and anyway, there are specific comics that are being given away - see the official website, detailed below, for the list). This event celebrates the independent comic book specialty shops. Each one is unique in its community, with a style and personality all its own, and each one carries a full line of comics, graphic novels, toys and related products. Free Comic Book Day is administered by a panel representing all parts of the comic book industry: retailers, publishers, suppliers, and Diamond Comic Distributors. Each year, publishers apply to provide comic books at cost to retailers, who in turn give them away for free. Diamond handles marketing and logistics for the event, shipping comics to shops and handling marketing and PR for the event. While the organisers of FCBD hope every one of these shops will take part, each shop determines on its own whether or not to participate. You can check their shop locator for a comic shop near you. - To find out if there's a shop near you taking part, visit: www.FreeComicBookDay.com, which has a shop locator service that will show you participating retailers in your area. Nelson, a new collaborative graphic novel from Blank Slate Books will be launching this November at the Thought Bubble convention in Leeds, and features an awesome line-up of British comics talent (detailed below). 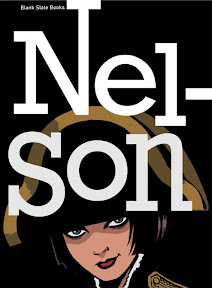 So, who is Nelson? Well, Nel Baker’s story starts in 1968 (the year of her birth) and takes us through to the present day, with each creator presenting a snapshot of one year of her life. “I don’t know if anyone’s tried anything like this before," says Rob Davis (Doctor Who, Don Quixote) the anthology’s editor. "I just think it’s a great way to show what separates comic artists from other artists – we don’t just draw pictures, we tell stories! 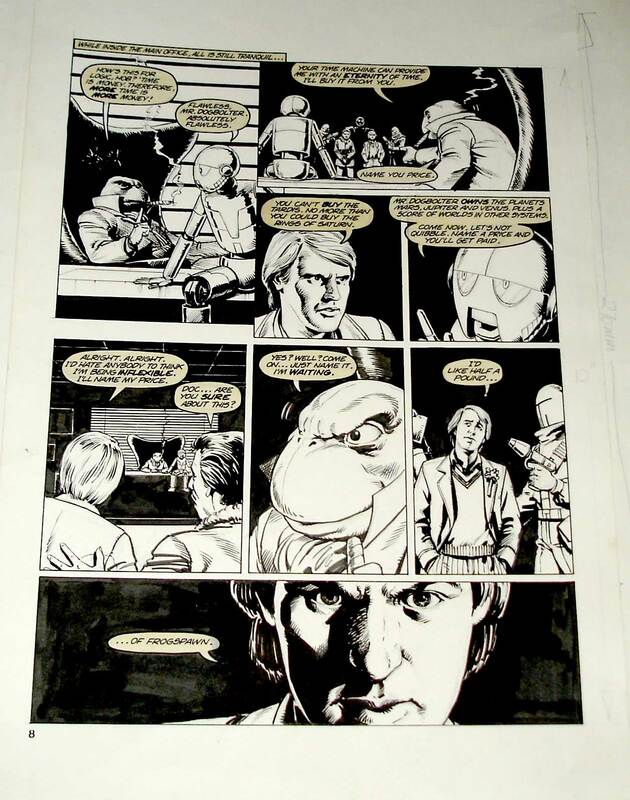 I'm reluctantly selling, via eBay, an original page from Episode Three of the Peter Davison story 'The Moderator', published in Doctor Who Magazine Issue 87, cover dated April 1984, drawn by Steve Dillon. The story, written by Steve Parkhouse, sees the Doctor and his new friend Gus arrive on Celeste. a world populated by intelligent soldiers. But all is not what it seems. The soldiers are under the control of the sinister Moderator who is using the gift of Celeste to create a link to Earth. Can The Doctor stop him inhabiting another planet? 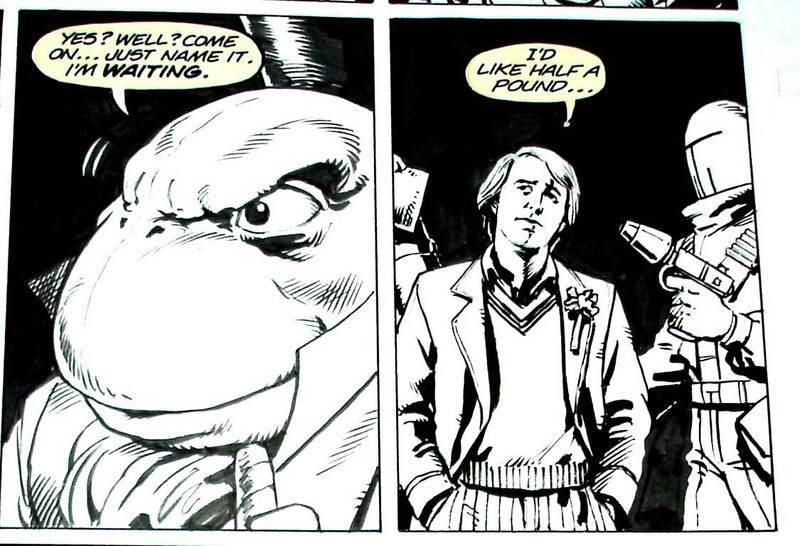 The page offered shows the amphibious Josiah Dogbolter trying to cut a deal with the Doctor for his TARDIS, which gets short shrift. The final frame of the page is a classic of the DWM comics, in my opinion. The The Tides of Time graphic album. The story also inspired events in The Incomplete Death's Head series, which also involved The Doctor. The art is in good condition with no speech bubbles missing, although they have coloured with age. Hopefully this is a page that will appeal to both Davison and Dillon fans. Following directly on story-wise from the previous book, Cinebook have released the second part of their latest Blake and Mortimer title, The Sarcophagi Of The Sixth Continent. 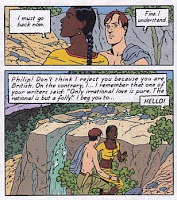 Created by writer Yves Sente and artist Andre Juillard and originally published in French in 2004 as Les Sarcophages Du Sixième Continent Tome 2: Le Duel Des Esprits, this follows on from Part One in which the eternal Indian Emperor Ashoka pledged revenge on the colonial powers and Philip Mortimer in particular. That revenge came as a psychic attack disrupting the 1958 World's Fair in Brussels. Blake and Mortimer have tracked the source of the attack down to the new Indian Antarctic base but having arrived on the sixth continent they are captured by Ashoka's men. Blake escapes and makes it to the French base but Mortimer is taken to the underground section of the Indian base where Ashoka explains his plan which includes forcing Mortimer into one of the psychic sarcophagi. However Blake is determined to lead a rescue attempt using a French new submarine, the Subglacior. 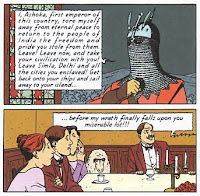 After all the problems at the World's Fair in the first book, and the very interesting back story of the young Philip Mortimer's encounter with the Indian nationalist Ashoka and his beautiful daughter Gita, the second book becomes more of a traditional Blake and Mortimer action story with the two characters separated and imperilled both by the villains of the piece as well as the natural forces of earthquakes and volcanoes. The Subglacior, which was mentioned in passing in Part 1, comes to the rescue as Blake needs to enter the underground base although its ability to travel through solid ice by melting it and then travelling through the resultant water probably doesn't bear too much thinking about. However that is irrelevant to the flow of the plot as Sente piles problem upon problem for our heroes with the Soviets siding with Ashoka as a natural disaster threatens everyone. The anonymous and apparently immortal Ashoka remains the most intriguing character with the second book returning to the first book's back story of the doomed love affair between Ashoka's daughter, the Indian Princess Gita, and the young and oh so English Mortimer. The details of this in the first book are enhanced with the second book's retelling of the tale from another person's perspective and, while it perhaps gives the reader enough information to figure out who Ashoka is, it is an interesting twist to both the back story and the main plot. Not as heavy going as many of the Blake and Mortimer books, The Sarcophagi Of The Sixth Continent Part 2 continues the enjoyable story from the first part and together they combine to make for a satisfyingly long adventure that sheds a surprising new light on the youth of one of the series' main characters. • There are more details of the English language Blake and Mortimer books on the Cinebook website. 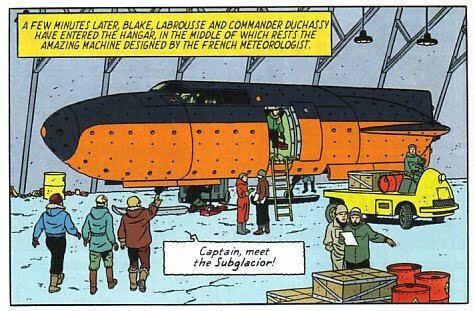 • There are more details on the series in general on the official Blake and Mortimer website (in French). The downthetubes review of Part One of this story is here. 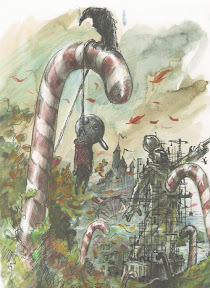 The Book: Winshluss’ Pinocchio graphic novel is an adult noir movie that at times is both comedy and tragedy. The narrative begins with a shooting, and then flashes back to Pinocchio’s creation (he is now a robot-like android) and adventures. Collodi’s original story is also darker than Disney’s version. Monstro the whale is replaced by a toxic, giant mutated fish, and there’s even a subplot of a hard-boiled detective woven in. The Review: First, before we even get to the story itself, I have to say comment on the actual production values of the book itself. 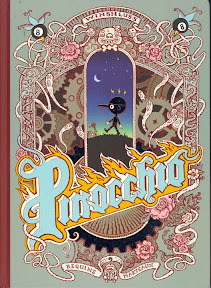 To say that Knockabout Comics edition of Pinocchio is sumptuous is an understatement: even before I started enjoying this dark, breathtaking adult take on the well-known fairy story, I was blown away by the high production values of the actual book. It's a beautiful hardback edition with the interior pages printed on great paper stock that do Winshluss' work full justice. Now for the story. Disney it certainly ain't. Winshluss (aka Vincent Paronnaud who co-directed the animated feature Persepolis with Marjane Satrapi) weaves an incredible tale encompassing the original story in a whole new form, mixed in with black humour, a crime sub plot and political satire, the latter very much part of Collodi’s original. 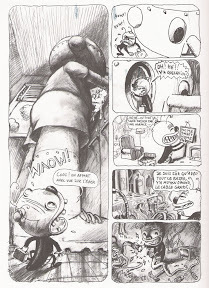 As for Pinocchio's famous talking insect - here, a cockroach, it doesn't meet the fate of the book's talking Cricket (that got squashed fairly early on), it doesn't have the greatest of times, even if it gets pretty much any dialogue in this otherwise fairly wordless comic. Art-wise, the story is breathtaking: it's primarily pen and ink, and watercolour but switches to paint for larger splash panels. Knockabout says many comic lovers and connoisseurs consider Winshluss to be the best comic artist of his generation, and I can see why. Pinocchio was awarded the Fauve d’Or at the Festival International de la Bande Dessinée in Angoulême 2009 and best foreign comic book in Germany 2010: awards well deserved for such an incredible storytelling. As an adult noir retelling of Pinocchio, that at times is both comedy and tragedy, Winsluss tells a very modern twist filled with incredible passion, charm and dark humour. Highly recommended. 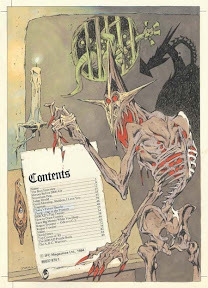 "Winshluss has perfected the wordless comic. Not a panel is wasted. Each is perfectly designed to for clear reading. 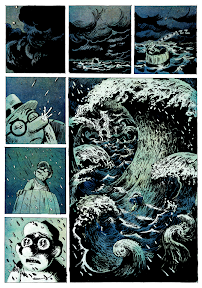 It’s refreshing to spend time with a graphic novel that doesn’t rely on words and talking heads to advance the story." "In this rendition of the classic tale, the wooden puppet becomes a mere android, designed by an engineer in search of recognition whilst the “talking cricket” character (cast as a cockroach by Winshluss) depicts a savvy homeless squatter quite content living very comfortably in the android’s skull. 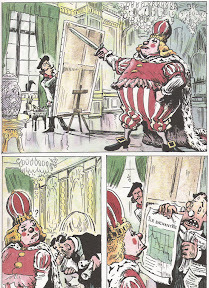 "Such irreverence transcends virtuosity; Winshluss reinvents archetypal clichés to form modern narrative – astonishingly his expressive graphics reside in this interpretation with virtually no dialogue (which I, for one, am thankful for given that my French is somewhat sketchy these days!). Ironically this dexterous narrative evokes a sense of childlike innocence – blissful freedom, pure and untainted imagination." "Winshluss has long been an energetic draughtsman, merging the subversive sensibilities of the underground movement with a palpable sense of punk abandon that owes more than a little to the great bad-taste humorist Vuillemin. 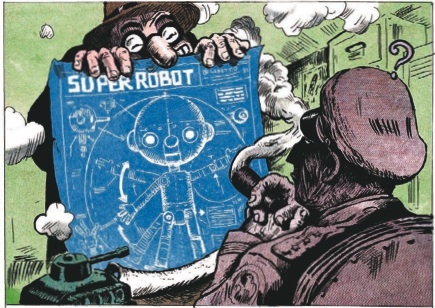 The result are gruff cartoons, grimy with saturated brushwork, that refreshingly tend to reach beyond the comfort zone of the artist, resulting in a kind of frenetic energy of invention that is both spectacular and moves the story along with humour and efficiency." Some of Kevin O'Neill's art from 2000AD and other titles is on sale from his agents, The Illustration Cupboard near Green Park, London. The agents, who also offer art from a large number of artists, have lots of prime 2000AD pieces including Nemesis the Warlock, Metalzoic, Dredd and some of the newer Masrshall Law illustrations and a few other pieces. Check them out: although individual pieces are on sale for a fair sum - over £3000 in some cases - we're installment payments can be arranged. Dying of cancer, combating demons and swigging from a bottle of laudanum – Inspector Harry Absalom ain’t exactly Inspector b***** Morse. 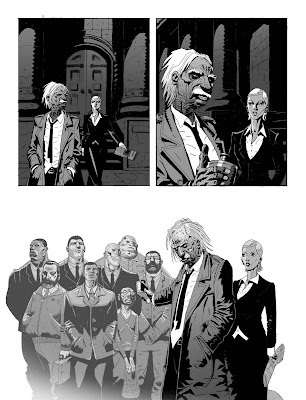 Mixing The Sweeney with The X-Files, Absalom is the latest dark tale from Necronauts writer Gordon Rennie, brought to gritty life with artwork from newcomer Tiernen Trevallion. 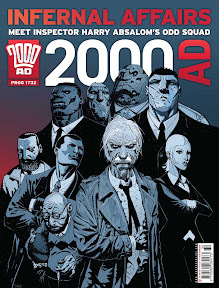 Premièring in 2000AD prog 1732 tomorrow (5th May), Absalom is a pseudo-spin-off from Rennie’s popular but unfinished Caballistics, Inc. series for 2000AD about a freelance team of demon hunters caught up in an ancient game of good versus evil. An old-school London copper, Absalom has been on the force for 40 years. He’s also head of a special squad that enforces The Accord, a diplomatic treaty made in the 15th Century between the throne of England and the powers of Hell, keeping tabs on the demons who walk amongst us. 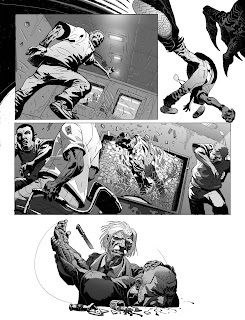 Gordon Rennie's past credits include Judge Dredd and Rogue Trooper for 2000AD (among many others) and he's recently written Monsterology, a new comic being drawn by PJ Holden which will be published later this year. Tiernen Trevallion describes himself as a "goat-based life form forced out of school at an early age for eating stationery, after which I decided college didn't deserve me." Ever since, he's been working as an illustrator, storyboard artist, matte artist and more: his illustrations recently featured in Black Library's The Bloody Handed and Barman's Tale, written by Jaspre Bark. He's also created album covers for bands such as Deadbeat Kaos, Malpractise and Bad Company UK. Dark, nasty and just a little bit funny – Absalom is another twisted tale from 2000 AD that lends new meaning to the phrase ‘demonic forces’. Lincoln University is running an event titled The World of Comics later this month as part of the Lincoln Books Festival (11th - 15th May), featuring artist Neil (Sarah Jane Adventures, 2000AD) Roberts and Murky Depths editor Terry Martin. "Comics and graphic novels have enjoyed an explosion of popularity lately, but what is the key to their success?" organisers Alt.Fiction (aka Writing East Midlands) ask. "Join us for this panel discussion with Terry Martin, award-winning publisher of Murky Depths and acclaimed artist Neil Roberts to explore this ever-expanding area of reading and writing. A great opportunity to find out more how comics and graphic novels come to life, and what the future holds for this growing art form." The festival also features an appearance by cartoonist Tony Husband alongside poet Ian McMillan (presenting their marvellous 'A Cartoon History of Here' show) and acclaimed SF editor John Jarrold. Edgar P Jacobs' MI5 chief Captain Francis Blake and Professor Philip Mortimer return in the first part of a two part adventure, The Sarcophagi of the Sixth Continent. 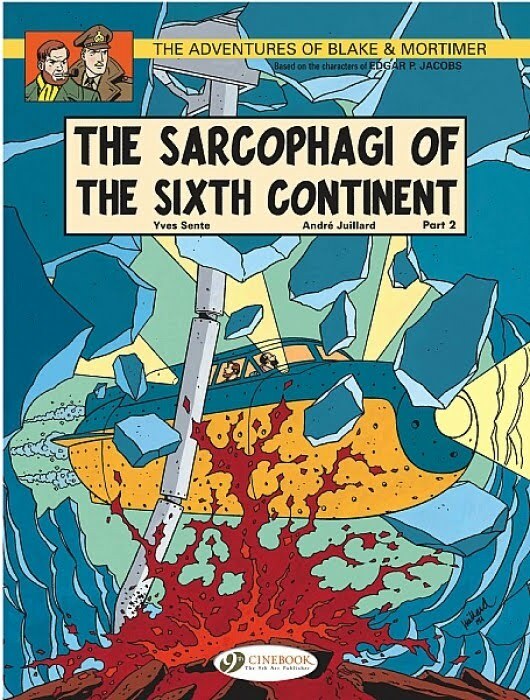 Originally published in French in 2003 as Les Sarcophages du Sixième Continent, Tome 1: La Menace Universelle, it was the second of the (to-date) four Blake and Mortimer albums created by writer Yves Sente and artist Andre Juillard. It is 1958 and Professor Mortimer is involved in the preparations for the British Pavilion at the Brussels World's Fair which will include real time scientific information being relayed direct from the British Antarctic Survey base at Halley Station on the coast of Antarctica. As well as providing the information for the World's Fair, the British base is helping the nearby new Indian base with power and supplies. However the Indian base is being used as a cover by the apparent reincarnation of the eternal Indian Emperor Ashoka, someone the young Philip Mortimer had come across many years before and who had vowed revenge on him as he blamed Mortimer for what had happened to his daughter. With the help of the Soviets, Ashoka plans to disrupt the World's Fair from his base in Antarctica, the sixth continent. Blake and Mortimer books, especially the original ones created by Jacobs, can be very text and plot heavy and, especially with the deliberate translation into the rather formal 1950s style of English, they can often be heavy going especially when the characters decide to sit around and discuss just where the plot has got to. Yet this first part of The Sarcophagi Of The Sixth Continent doesn't seem to fall into that trap. Perhaps it is because there is so much going on with so many different characters or perhaps it is the fact that there are effectively two different but interconnected stories with the 'modern day' plot set in Brussels and the flashback in colonial India. With 'sarcophagi' in the title, the book gives the impression that the story will be somehow mixed up in archeology and yet the opposite is very much the case with the sarcophagi, when they appear, being much very much ultra-modern technology - for 1958 at least. However the delight of this book isn't the main plot of the attack on the World's Fair but rather the long flashback to the doomed love affair between the young clean shaven Philip Mortimer and Princess Gita, Ashoka's daughter, and the revenge that her Indian nationalist father plans against both Mortimer and the colonial powers of the West. 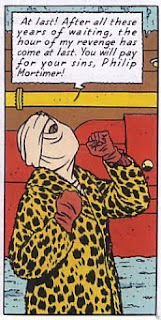 It helps to put a more human face on Mortimer as well give the book's main villain the strongest of motives. 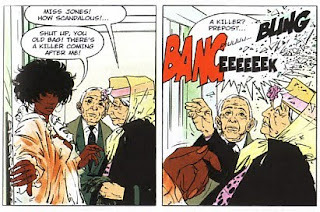 If this "origin story" of Mortimer isn't enough, Sente adds a string of characters familiar from other Blake and Mortimer books from both Jacobs' original titles as well as the more modern books including, of course, the duo's seemingly perpetual nemesis Colonel Olrik. Since most are only used fleetingly, a good grounding in B&M continuity is not required but it is a nice touch for the fans of the series and logical to the plot that so many of the Professor's scientific acquaintances would be helping out at the many pavilions at the World's Fair. 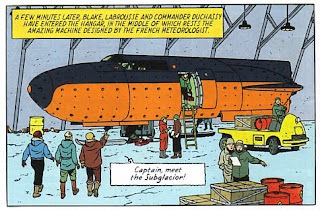 The rest of the book deals with the attack on the Fair and Blake and Mortimer's realisation that it is originating in Antarctica and that is where they must go to to deal with the threat, a journey that will take them into the second part of the story and the next book. 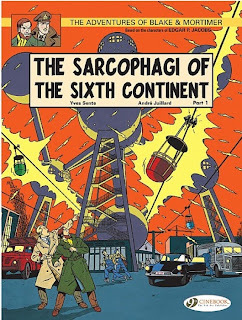 Whatever it is that sets The Sarcophagi Of The Sixth Continent Part One apart from other Blake and Mortimer stories, be it the flashback, the double story or the characterisation, it makes for a story that is more interesting than some of the other Blake and Mortimer books that I have read and left me eager to read the second part. Book 1 - Alan Smith? Book 2 - Captain Steve Rowland? Book 3 - Prisoner Steve Rowland? Book 5 - Jason Fly? 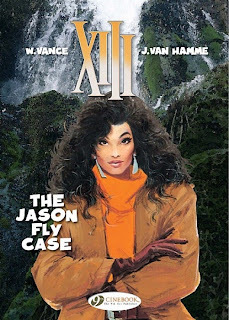 The sixth book in the XIII series begins a new story arc within XIII's ongoing quest to discover who he is in The Jason Fly Case. After all his name changes in the previous books it seems that XIII may be a US undercover agent called Jason Fly. Leaving the recuperating Major Jones behind, who isn't convinced XIII is Fly anyway, XIII heads for the hills and the snowy hamlet of Green Falls. This is where the case notes tell him Jason Fly lived as a child and he hopes that the place may spark some memories. In the near snowbound town he tries to piece together the death of Fly's father helped by the local newspaper proprietor and distracted by the dishy local pharmacist. 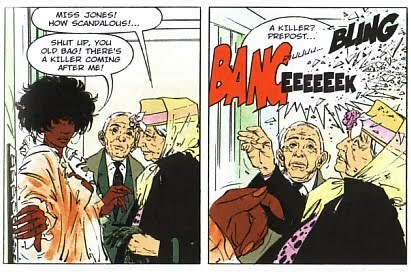 However when he tries to speak to the first person he meets who actually knew Jason Fly, the local sheriff intervenes and events take a turn for the deadly with the reappearance of the man known as The Mongoose, who targets first Jones and then XIII himself. After the international events of Full Red, writer Jean Van Hamme takes XIII back to small town America and the series initial concept of finding out who the character really is while avoiding the deadly Mongoose. The Jason Fly Case is altogether quieter that the last couple of books giving both XIII and the reader a breather from the non-stop action as well as a small town mystery to ponder over. Of course it doesn't stop the body count rising or for that matter XIII's sidekick Jones ending up in yet another hospital bed. Originally published in 1989, William Vance's artwork does show a little of the cusp of the 1990s with Judith Warner's big hair and XIII driving a Volvo 480, but it really does not distract from the detailed scenery, and the action sequences, when they come, are his usual dynamic and violent best. XIII - The Jason Fly Case is a change of pace for the series after the last few books but, if anything, it actually returns the series to is roots as XIII attempts to discover who he really is and that, after all, is what made the series interesting in the first place. 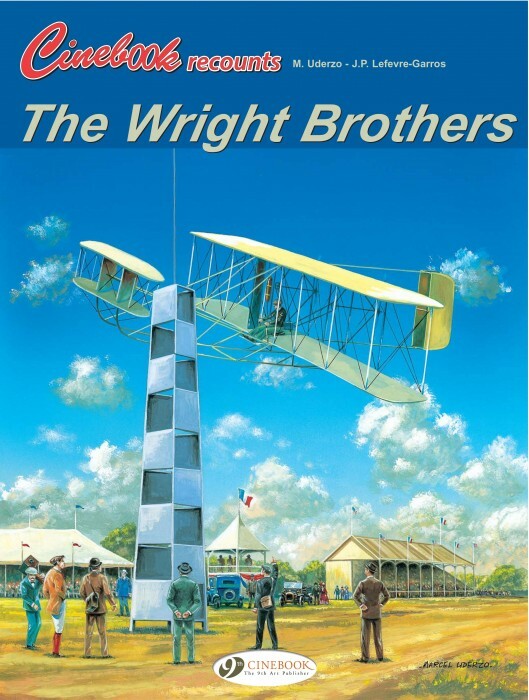 With the book ending on a cliffhanger, nothing about Jason Fly is resolved and we will all be back in May 2011 for Book 7 - The Night Of August Third. • There are more details of the English language XIII books on Cinebook's website. • There are more details of the original French XIII albums on the official XIII website (in French).